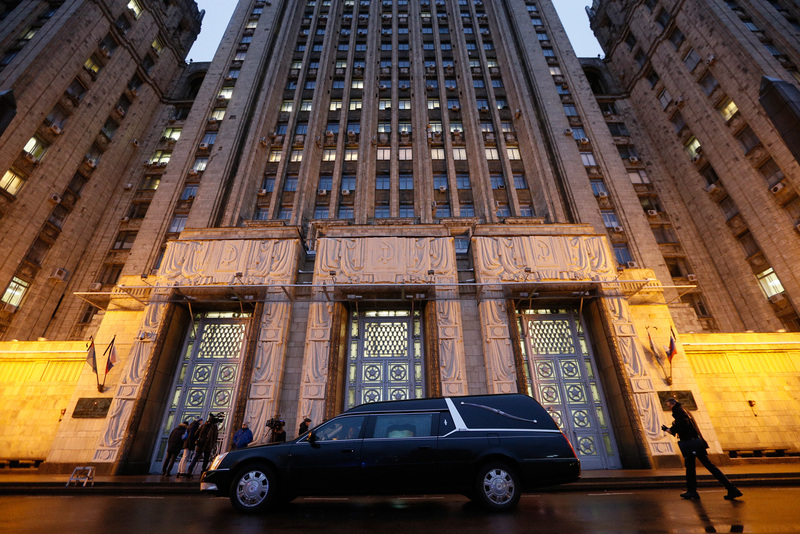 A hearse with the body of Russian Ambassador to Turkey Andrei Karlov outside the offices of the Russian Foreign Ministry ahead of a farewell ceremony. Karlov was shot dead in the Turkish capital, Ankara, on Dec. 19, 2016. A farewell ceremony for Russian Ambassador to Turkey Andrei Karlov, killed in Ankara on Dec. 19, has begun in Moscow. The ceremony is taking place in the entrance hall of the foreign ministry’s main building where Andrei Karlov’s coffin has been placed. Servicemen of the Preobrazhensky Regiment of the Russian Armed Forces are carrying the guard of honor. Family members and the foreign ministry staff are bidding farewell to the ambassador. Security measures have been tightened in the area. Russian President Vladimir Putin is expected to participate in the farewell ceremony. Head of the Russian Orthodox Church, Patriarch Kirill of Moscow and All Russia, will conduct a pre-burial prayer service for Karlov in the Cathedral of Christ the Savior. Russia’s Ambassador to Turkey, Andrei Karlov, was gunned down on Monday night while he was delivering a speech at the opening ceremony of a photo exhibition dubbed "Russia from Kaliningrad to Kamchatka through the eyes of travelers". According to Turkey’s authorities, the attacker was neutralized by security forces. The attack also left three people wounded. Russia’s foreign ministry officially declared it a terrorist attack, while the Investigative Committee opened a criminal case labeling Karlov’s assassination an act of international terrorism.